We invite you to experience the new Crowne Plaza Cleveland Hotel City Centre located in the heart of downtown Cleveland and overlooking beautiful Lake Erie. Our great central location places us within walking distance to all of Cleveland&regs major attractions including Brown&regs Stadium, Q Arena, Progressive Field, Playhouse Square and the Warehouse and Flat&regs Entertainment & Restaurant districts which makes us a great choice for your business or leisure travel needs. The Crowne Plaza Hotel Cleveland is conveniently located adjacent to the Cleveland Convention Center, the Federal Government Building and is the closest hotel to the famous Rock and Roll Hall of Fame Experience the city at its best - during your comfortable stay at our downtown Cleveland hotel setting. With 470 spacious and elegantly decorated guest rooms and suites, complimentary high speed Internet access in every guest room, 27,000 square feet of meeting and banquet space, our hotel provides guests with a superb level of service, and high-quality accommodations at reasonable prices. Enjoy dining at our fabulous restaurant-Pimentos which has all of your favorites including a made to order pasta lunch buffet. Also, relax at the Green Olive Lobby bar, which features great beverages and appetizing meal options. 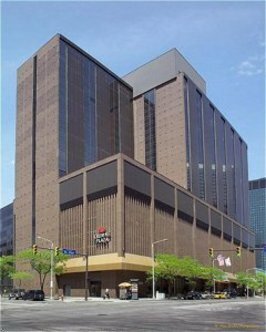 We are certain that the Cleveland Ohio Crowne Plaza Hotel Cleveland City Centre is the place to meet and we look forward to having you as our guest This hotel is committed to providing accessible facilities under the American Disabilities Act. If your accessibility needs are not met, please contact the Hotel Manager on Duty. Should you require additional information regarding accessible facilities for guests with disabilities, please call 1-800-Holiday (U.S. and Canada) or contact the hotel directly. For the hearing impaired, TDD service is available at 1-800-238-5544 within the U.S. and Canada.